In the 17th and 18th centuries, and even into the mid-19th century, the world’s most exclusive violin makers sourced wood felled in the south slopes of the Alps that their dealers floated down the Po River to the Italian town of Cremona. Antonius Stradivarius and Giuseppe Guarnerius, Cremona’s most prominent luthiers, famously bought wood sourced from the Swiss Alps and the Carpathian Mountains. New York violin maker Samuel A. Stochek had a different approach. In the 1940s, his tonewood came not from renowned European mountain ranges, but from 19th-century New York buildings and houses under demolition during the Great Depression. Though his sources were unorthodox, his success was undeniable. Stochek’s floorboard violins were played in Carnegie Hall by the world’s most famous violinists. But what became of those improbable violins, each a portal to another century? And who would tell their stories? A recent Internet name search turned up Stochek’s daughter: a Westport, Connecticut violinist named Bernice Stochek Friedson, who owns three violins made by her father. She was not aware of any others that have survived. At her home, Bernice picked up a battered violin case covered in crackled alligator skin. She proudly explained the craftsmanship: The back was a solid piece of maple, the sides had maple ribs, and the front was beautiful spruce. Then she opened up two more old cases, revealing the ¾-sized violin her father made for her when she was in first grade, and a violin he had crafted for a forgotten 1940s performer named Ossy Renardy, who died in a car crash at the height of his fame, aged 33. 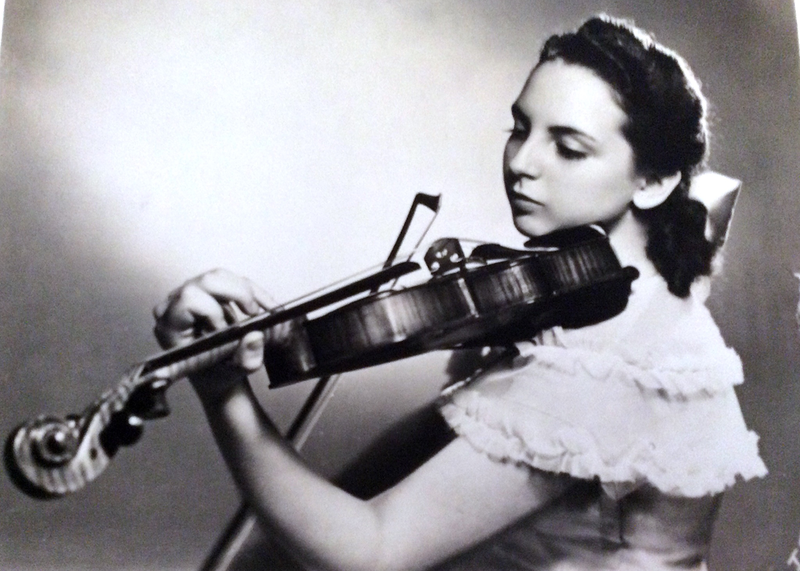 Bernice said her grandmother Yetta had pressed her father to play at seven, on a violin her grandfather bought for a few dollars. Her dad had resisted his lessons even though he did have a natural musical ear; he loved the music but hated people telling him what to do. To disappoint his mother further, Samuel quit school in sixth grade, and wouldn’t return. As a teenager Stochek found work in an auto shop, where he discovered he loved working with his hands. His cheap childhood violin had always been an embarrassment. Even as he managed to trade up for more expensive models, he toyed with idea of making his own. He caught wind of Paul and John Homenick, two Ukrainian brothers in their 30s who had brought their Old World mandolin skills with them to Ellis Island. As soon as they had a mandolin business going at 166 East 2nd Street they added violins. The Homenicks were of Catholic faith, but had opened their shop in a crowded immigrant Jewish community. Many an older New Yorker will joke that Jewish boys in this neighborhood of immigrant strivers had two choices back then: to follow the path of violin superstar Jascha Heifetz or to pursue science like Albert Einstein. The Homenicks took on the dogged Jewish kid as an unpaid apprentice, and asked him to make a violin. In 1925 they sold it for $50. Stochek got so excited he made 12 more that year, which he soon learned was an okay output for a quickish buck, but not conducive to quality. His workmanship was good, and it took a while for his skill to really solidify. But Stochek knew he had found his calling, and committed himself professionally in 1927. His greatest obstacle was affording quality tonewood—wood with tonal quality, like sycamore, spruce and maple. In the old guilds of Europe, by tradition, a violinmaker might pay it forward and save top-notch tonewood for the next generation. More often than not American luthiers in the 1920s secured their preferred wood from Italy and Yugoslavia or Germany, and got their supply shipped to New York docks. Even into the early 20th century, before you could hang out a shingle in Fribourg or Berlin or Munich and call yourself a violin maker you would have had to study for four years, then work as a journeyman. Then you would have to go back and study for another two years, to get your masters papers. Until you became a master violin maker, you couldn’t make a violin with your name on it. One could not say, “I’m a violin maker, I’m self-taught.” But Stochek did. Stochek couldn’t afford to ship wood from suppliers in Europe, so he hit upon the cost-effective strategy of reclaiming perfectly usable tonewood from New York’s wrecked and gutted buildings—conveniently pre-aged lumber. According to his daughters Bernice and Gloria, he told them he knew where to concentrate first: homes near Canal Street; buildings at least 70 or 80 years old. Uptown there was too much steel. But even in the squarely midtown district he had some luck. Through the Homenick brothers, Stochek also got ahold of a “How To” book called Violin-Making, As It Was and Is: Being a Historical, Theoretical and Practical Treatise on the Science and Art of Violin-Making for the Use of Violin Makers and Players, Amateur and Professional. The book was written in 1884 by Edward Heron-Allen, who had apprenticed with master violin maker Georges Chanot. On his own, Stochek perfected his templates, varnish, and all the details of gradation, and then set up his first small shop in Brighton Beach, Brooklyn. As to where, exactly, the wood for Stochek’s violins came from, in Berger’s original article there’s mention of a 150-plus-year-old curly maple floorboard from a lean-to in New Brunswick, New Jersey. There’s a hundred-year-old board marked for a violin back that came from an old house on Elizabeth Street near Canal Street, one for which Stochek paid 15 cents to an old watchman. There’s also mention of a light-brown spruce log from the back of an old house near where a racetrack once stood in Sheepshead Bay, Brooklyn, a quartered log destined to be a sound post or bass bar, or both. Stochek also mentioned a fine piece of wood he rescued from the last days of Hotel Shelburne. Long gone from public imagination, the magnificent Hotel Shelburne, built at the tail end of the 1800s, was once the last survivor of the “Big Four” Brooklyn Atlantic seaboard hotels popular in the Gay Nineties and beginning of the Jazz era. The enormous guesthouse was foreclosed in 1928 to make way for an Art Deco six-story apartment building called the Shelbourne Apartments, with added o, that still stands at 3100 Ocean Parkway. Even during Prohibition, the Shelburne, with 200 rooms and 75 private baths, generated revenue off its dance floor and shore dinners of lobster and steaks. In May 1928, after the hotel’s interiors, furniture, and diningware was auctioned off, the Shelburne was razed. Stochek told Berger he picked out spruce and maple from the ruins. Sam knew that in order to be taken seriously as a luthier, he’d have to relocate from Brooklyn to Manhattan, and settled on a site near the performers in the NBC Symphony Orchestra and the New York Philharmonic. In 1938 he launched a second store at 117 West 48th Street, right above Budapest, a Hungarian restaurant with a floorshow that was part of the racy nightclub scene that openly reestablished itself after Prohibition. A spiffy profile in general-interest magazine Coronet followed, and then a three-page step-by-step how-he-does-it photo piece in the glossy See magazine, so popular with soldiers because of the pinup stars on its covers. “Stochek instruments take three months to make, three to six months more for the Stochek-blended oil-varnish to dry,” began See. Now that the business had really started to take off, the Stocheks moved again, finally to the fancy violin makers’ street of West 57th Street, between 7th and 8th Avenues. The best were here, clinging to the action of Carnegie Hall, and the biggest commercial studios further west along 57th. Here Stochek sold his violins for $1,000 each—double what standard U.S.-based luthiers could fetch for their instruments. Dr. Catlin was in the store again to pick up his cello when he heard Stochek’s daughter Bernice practicing, and was impressed by her credentials, which Stochek happily rattled off, including full-length violin recitals at the age of seven in the John Wanamaker department store and the Barbizon Hotel. Much to their delight Catlin then asked her to play for his famous father-in-law who owned all those priceless violins. She went with her father to the Havemeyers’ extravagant home, where the last Vermeers to be privately owned were prominently displayed in the living room. And then, much to Bernice’s amazement, Havermeyer announced he would lend her the Kiesewetter Stradivarius crafted by the master around 1723, and later owned by German composer and violinist Christophe Gottfried Kiesewetter. Stochek was beside himself, almost crying. With a famous Stradivarius to secretly study, Stochek got even better, and got even sweeter prices in wartime New York. Stochek made significantly fewer instruments by the end of the ‘40s, three or four each year, for such concert and radio artists as legendary cellist Leonard Rose, William Lincer, the principal violist of the New York Philharmonic, and even child prodigy Ruggieri Ricci. After a debut at nine, Ricci had once been profiled as one of the most famous six children in the world along, with Jackie Coogan and seven-year-old Queen Elizabeth. In 1948, Bernice played one of her father’s violins on the big-time TV show Arthur Godfrey and His Talent Scouts, a precursor to American Idol and America’s Got Talent that launched everyone from Pat Boone to Tony Bennett to Patsy Cline. She won. In 1951, Stochek moved to Mount Kisco in Westchester, north of the city, and opened a music store where he sold and repaired all instruments: brass, woodwind, and percussion instruments and of course strings. After this final career change, he barely made another violin. In 1976, he died in his home from emphysema.